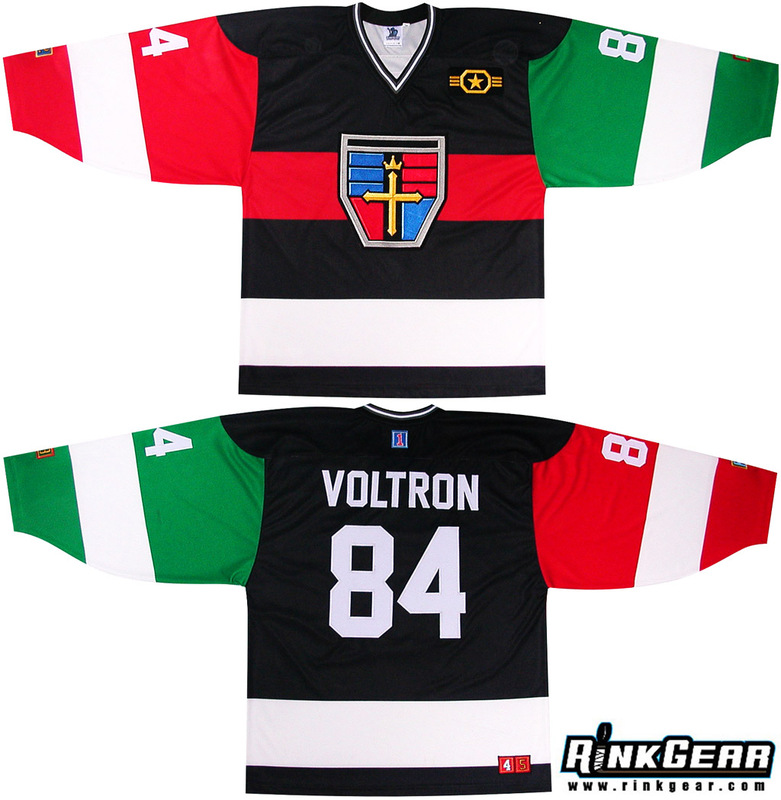 Voltron Hockey Jerseys Are Done! Another amazing jersey completed by Rinkgear! I love it. It evokes the simplicity of the Detroit Red Wings, albeit with a much larger color palette. Just amazing work by the folks at Rinkgear. Lots of patches and beautiful embroidery work on the main shield. UPDATE: Turns out, Rinkgear embroidered every patch on this jersey – all the Lion numbers and the ‘star’ logo. Wow. Announcement: These will be available at C2E2 (April 13th-15th) at Voltron’s booth (#430). So swing by and say hello to the folks from WEP and check out the jerseys. Maybe you’ll see a few people wearing them on the show floor too. Posted on April 11, 2012, in Completed! and tagged C2E2, Completed!, detroit red wings, Voltron. Bookmark the permalink. 6 Comments. Wow, I am just blown away with this design! It’s a great balance between the colors and the design elements; not too plain but not too busy either. I just love it! Also, I just recently discovered this web site yesterday and would like to know if you plan on making these available again? Or is there a site where I can order one? Again, great job! These might be available from voltron.com in the next few months. We’ll see how the limited run does at C2E2 this weekend. I can’t wait for mine to come in the mail. It will look like the one in the photo. 84 becasue it’s the year the cartoon came out and VOLTRON of course because that’s what the jersey is of. I need this. Badly. Wish I was going to C2E2!! !